What is home? What if you spend your whole life in a place that isn’t your home? 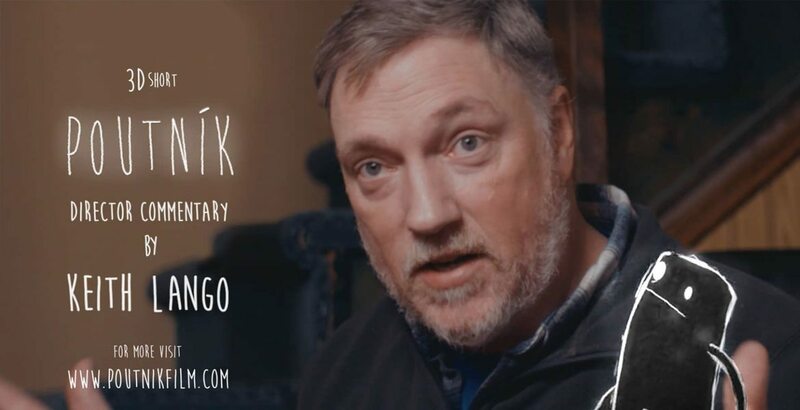 These questions are raised by the new short Poutník by director Keith Lango. Lurpy, the film’s main character, has to deal with the question of what to do when he wakes up in a strange, unfamiliar environment with the sense that it isn’t his home. The story not only addresses the topical issue of refugees but also touches on the unpleasant feeling of alienation in our lives. But more than anything it shows a new, and in the Czech context original, way of producing animated films that make a little go a long way. In the past, shooting a film or even a short video demanded a great deal of effort. However, with the development of technology and the internet it is no longer such a problem. New formats of web serials abound on YouTube. In this regard animation is at a disadvantage, as it takes a very long time to produce in comparison with live and pre-shot work. The eight-minute animated film Poutník shows, however, that it is possible to markedly accelerate the animation process. The Czech production company3BOHEMIANS, in cooperation with 3D animation pioneer and guru Keith Lango, who is currently working with VALVE, have created the film Poutník; the idea behind it was to make a short animated film using 3D computer animation techniques that visually resemble hand drawn animation. Keith Lango’s short films are today legendary as they represent the single-mindedness of following one’s dream and learning to animate in 3D at a time when there no education programmes or schools for it. Lango was the first ever animator to produce, at the turn of the millennium, video guides that made it possible for a new generation of animators to make use of techniques that the entire world later acquired. “Character animation in 3D is our specialisation. It is also part of popular technology and a professional tool for many projects, in particular at the international level. It has wrongly been regarded as an overly expensive solution, or only suitable for commercial use, for ‘Hollywood’. We often meet the view that 3D animation isn’t part of Czech cinematography. I have to reject such views as inexpert,” says David Toušek of 3BOHEMIANS. “Alongside story and art, the core of authorial work, we have attempted to focus on the provision of greater artistic space and the animators themselves. In regular production, animators have virtually no room to realise themselves artistically, as they receive a clearly set-out storyboards or animatics with an already conceived acting performance of virtual characters. In team production, they are in the position of service providers under the baton of a director,” Toušek adds. Keith Lango shared his basic ideas with each animator and the animators then created their own acting ideas. The task facing Keith Lango was to deliver a solution that enabled animators and artists to produce stories in rapid succession, meeting regular distribution deadlines. It is not possible to reduce quality or amount of detail in just one area. Rather the reduction in elements must be consistent at all levels – in design, setting, animation, rendering. The film Poutník is an experiment in how to reach the absolute minimum while at the same time using that minimum to create – thanks to modern 3D animation tools – a high-quality, effective production. Twenty-two animators worked on it for two weeks. “We opted for combined 3D and 2D technology in a real environment. The result is 3D animation that possesses a different visual character than is the norm with such animated films. Thanks to the tools in the 3D programme, artists and animators can focus fully on storytelling and the acting performance of their characters at a speed that surpasses classic hand techniques,” says Lango. He dismisses the suggestion that 3D is expensive and slow technology. Proof of this is the film Poutník, in which the animation process was markedly accelerated, gaining ground on live-action film.